Jefferies’ price target for Ninetendo is almost double current prices. Analyst Atul Goyal prides himself on topping the rest of Wall Street, and just upped his target once again. Nintendo’s biggest fan on Wall Street just increased his price target yet again. “The Street is slowly catching up to our numbers, but is still miles away,” Jefferies analyst Atul Goyal said in a note to clients. He raised his price target to ¥79,900 a share ($US755) – about 42% above the stock’s Wednesday closing price in Tokyo. For comparison, Wall Street’s average target for Nintendo is just ¥58,300 ($US550). “When we published our forecasts last year, we made it clear that even our street-high forecasts were actually quite conservative and ‘the risk to our street high numbers was to the upside’,” he wrote wrote. Goyal’s Street-topping estimates relay heavily on new releases by Nintendo, something the company’s president, Tatsumi Kimishima hinted at earlier in February. “The main feature of Nintendo Switch is that it can be played ‘anytime, anywhere, with anyone,’ so our focus in the second year will be to continue to release numerous software titles that provide that experience and hammer home that concept and encourage consumers to discover their own ways of having fun,” Kimishima said, according to Goyal. Still, Goyal remains cautious on the Switch and its Labo creation platform, saying his estimates are conservative for Nintendo’s first new device since the Wii U was released in 2012. 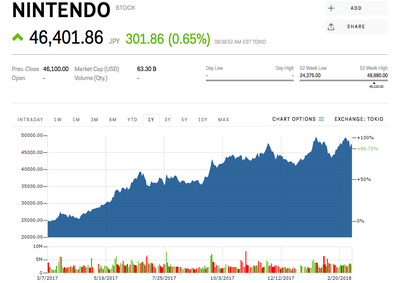 Shares of Nintendo are up 86% in the past year.